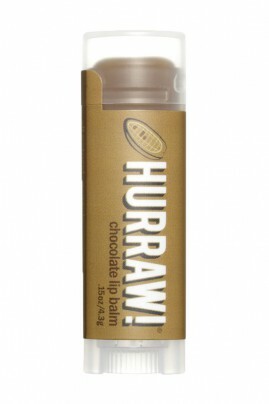 Hurraw Natural Lipbalm Chocolate gives you the delicate taste of your favorite hot chocolate ! Its formula rich in organic oils and butters made from premium raw, protects and nourishes. Your lips are smooth and moisturized with its natural delicate fragrance. All the Hurraw Lip Stick Balms are 100% natural, vegan (no animal-derived ingredient) and crueltyfree (not tested on animals). Handcrafted production, the quality of cold pressed oils and raw buttersissuperb : you will see the difference ! Discover their complete range of 25 different flavours ! makes this balm an anytime treat ! Apply HURRAW Vegan Lip Balm at any time when you need it ! 100% natural & yummy chocolate treat and zero carb ! Prunus amygdalus dulcis (sweet almond) oil*, Euphorbia cerifera cera (candelilla) wax***, Theobroma cacao (cacao) seed butter**, Cocos nucifera (coconut) oil*, Ricinus communis (castor) seed oil**, Simmondsia chinensis (jojoba) seed oil**, Olea europaea (olive) fruit oil**, natural flavor, Theobroma cacao (cocoa) seed paste**, Tocopherol, Vanilla planifolia (vanilla) seed*.